I turn on my computer. I wait patiently as it connects. I go online. 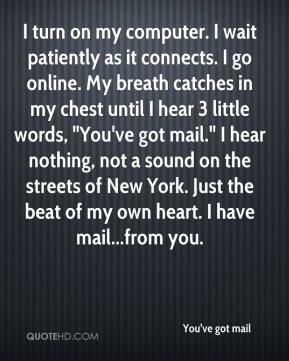 My breath catches in my chest until I hear 3 little words, "You've got mail." I hear nothing, not a sound on the streets of New York. Just the beat of my own heart. I have mail...from you. 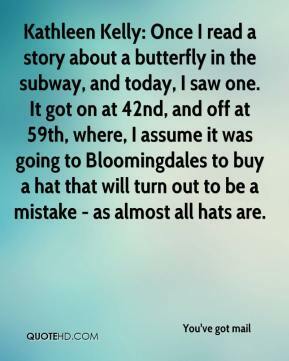 Kathleen Kelly: Once I read a story about a butterfly in the subway, and today, I saw one. It got on at 42nd, and off at 59th, where, I assume it was going to Bloomingdales to buy a hat that will turn out to be a mistake - as almost all hats are. 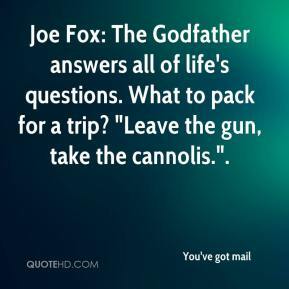 Joe Fox: The Godfather answers all of life's questions. What to pack for a trip? "Leave the gun, take the cannolis.". I like Patricia. I LOVE Patricia. 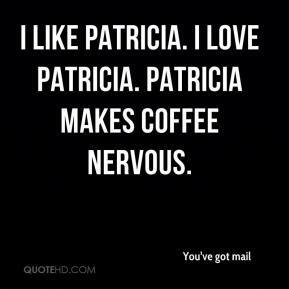 Patricia makes COFFEE nervous. 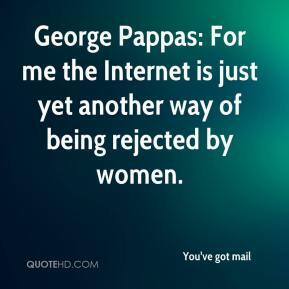 George Pappas: For me the Internet is just yet another way of being rejected by women. Joe Fox: Brinkley is my dog. He loves the streets of New York as much as I do. Although he likes to eat bits of pizza and bagels off the sidewalk and I prefer to buy them. 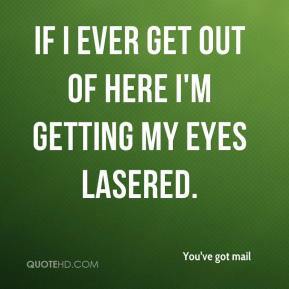 If I ever get out of here I'm getting my eyes lasered.